Record direct from the camera sensor to your choice of Apple ProRes, DNxHD/DNxHR or RAW* in 10-bit 422 quality onto affordable media options. Based on the camera’s output the Shogun can accept and record up to 4K 30p and HD 120p over HDMI or 12/6/3/1.5G SDI. Full playback controls allow collaboration on set to review content the moment it’s captured, using the full suite of monitor tools on screen or out to a larger HDMI or SDI monitor. There is even 4K to HD down scaling to connect with existing HD infrastructure. 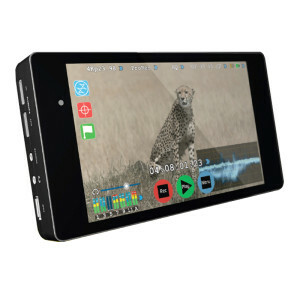 A stunning 7.1” 1920 x 1200 over 320ppi IPS screen makes Shogun perfect as a director’s monitor. Shoot more accurate colors with class leading 3D LUTs, 2:1/1:1 zoom for critical focus, waveform, focal assist and an optional Spyder calibration unit. It’s the perfect tool for perfect creative shot setup. ©2019 SLVision 70-74 Stewarts Road, London, SW8 4DE tel. +44 (0) 20 7720 6464 shoot@slvision.co.uk Prices are for guidance only and may vary.